From ribbons to multi-touch, musicians are looking for expressive controllers, ones that allow continuous control for performance. So, one of the things I noticed when the Monome was first introduced was, excellent as that open controller is, you’ve got buttons and no continuous controls. Ever wished another nice square box could sit next to it and give you multiple touch controllers? Good news: Stribe is here. The Stribe is an 8-channel multi-touch controller for music or video software. 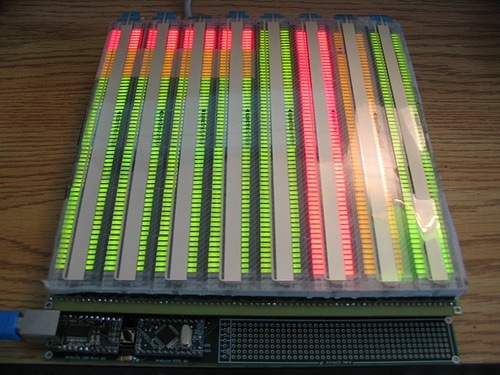 1024 individually-addressable LEDs provide animated visual feedback. The low-resolution (16 x 64) LED display is controlled in real time by either firmware or host software, or both. MIDI or OSC communication to compatible hardware and software is achieved via patches written in Max/MSP. Touchstrips down the center of each channel trigger events in the software and the firmware, which drive the display, creating a haptic feedback loop. Each of these eight “channels” has two 64-led-tall columns, e.g. a left and a right. Phineus created the Stribe (see more on his blog) after being inspired by the Monome, and uses his Monome and Stribe side by side. Whereas the Monome is typically procured as pre-built hardware or kit, Stribe is a DIY project (donations welcome). The basic components are pretty simple: standard lights and touch sensors. You can find all the specs and software, plus a new forum, on the Stribe site above. I’ll be making one, that’s for sure. Too cool. And I think some improvements could be made in the case design, as well. It’ll be interesting to see where people take this.